Isaac Eng, junior, strides up the hills at highland. This was the third meet of the season for The Royals. 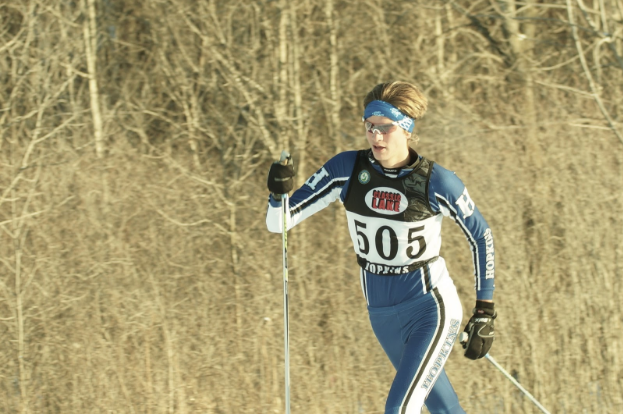 As the Nordic ski team goes down the home stretch, one head emerges over all. At 6’7”, Isaac Eng, junior, has just began to realize his potential in this sport. Eng has the raw skills to be a top competitor at the varsity level. Although being quite new to the sport, Eng has used his physical gifts to his advantage. “When you’re poling, the more leverage you can get the better. That’s a huge advantage for me. I take bigger strides than other kids,” Eng said. As Eng has began to take the sport more serious, he has taken his own twist to pre-game rituals. Eng truly loves the team and will miss the Nordic squad.